Founded in 1949, Hornady is a company with humble beginnings. Starting out as a simple two-man operation, the company's focus on innovation and performance has earned them respect in the industry. Today Hornady is a world leader in the ammunition production. 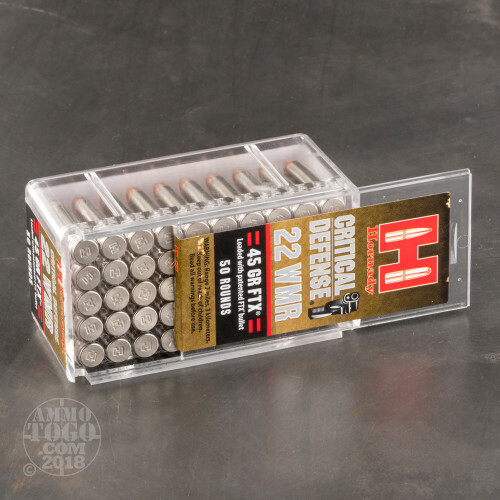 An ideal choice for concealed carry and personal protection applications, Hornady’s Critical Defense line was developed to deliver dependable terminal performance. 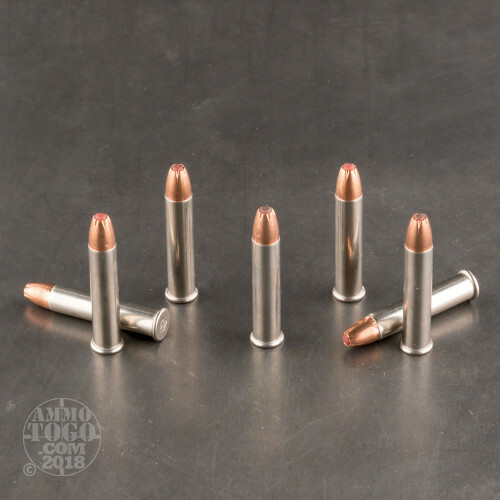 With this round you get the stopping power of a traditional hollow point without the clogging and inconsistencies often experienced with those rounds. This package contains 50 rounds of Hornady Critical Defense .22 Magnum (WMR) ammunition. Each cartridge is loaded with a 45 grain FTX (Flex Tip Technology) bullet with a soft polymer insert for controlled expansion. These rounds are optimized for use in short barreled firearms and deliver superb accuracy and devastating terminal performance. This ammunition is factory fresh, non-corrosive, and boxer primed. Cases are made of corrosion resistant nickel plated brass. With a bright silver color, these cases are highly visible, even in low light conditions, and offer smooth and reliable feeding and function. These rounds also feature clean-burning propellants for consistent performance, reduced recoil, and minimized muzzle flash. Leaving the muzzle at a velocity of 1000 feet per second, each round delivers a muzzle energy of 100 foot pounds. 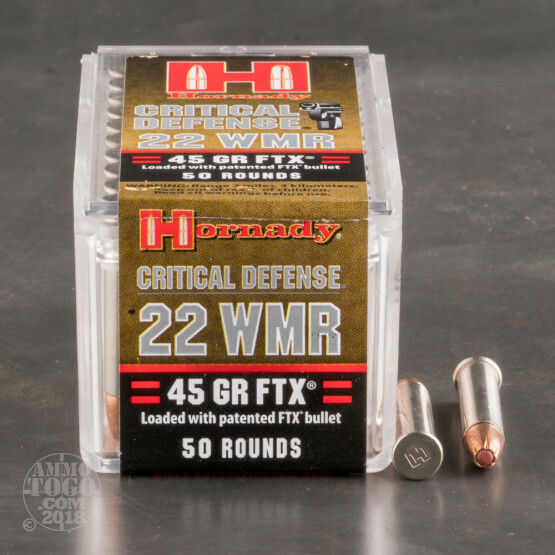 How do the results for this Hornady Ammunition 22 Magnum (WMR) compare to other 22 WMR (22 Magnum) ? 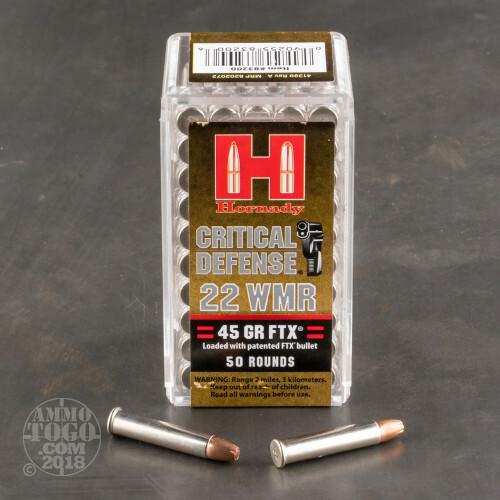 Expansion Diameter Compared to All 22 Magnum (WMR) Ammo Tested MIN 0.22" MEDIAN 0.22" THIS AMMO 0.22" U.S. dime MAX 0.33"
Penetration Depth Compared to 22 Magnum (WMR) Tested 0" 10" 20" 30" MIN 10.2" MEDIAN 14.9" THIS AMMO 19.5" MAX 24"